Publisher Titan Books did a huge favour for the art community with the reprints of Andrew Loomis books. Apparently, there was an unfinished Loomis that never made it to publication. Well, this is that book. 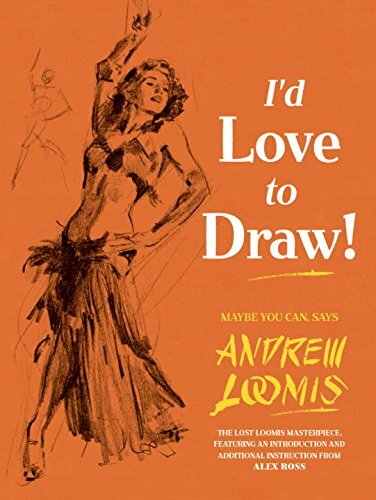 I'd Love to Draw is a drawing book targeted at the absolute beginners. Loomis' text is as usual very encouraging but some of the text are written in cursive letters which I find difficult to read. Compared to other Loomis books, the instructions here are made simpler, to the extent that I felt they are lacking in depth. The book covers drawing of basic objects (using geometry), perspective, lighting, drawing the head and figure. The structure is fine but in many cases there could be more explanation included to help beginners. Basic drawing tips are present, but the book had much more potential. A good portion of what's taught here is quite similar to the content in Fun With a Pencil. The sketches and main text for the book were already completed by Loomis, just that the captions were missing. So comic book artist Alex Ross was enlisted to help finish the book. If you've read Alex Ross' artbooks, you'll find out that he cites Loomis as one of his main influences. For the last two chapters on drawing the head and figures, Loomis provided only the introduction while Alex Ross had to give captions to all the drawings and he did quite a good job filling in the blanks, providing insight and tips. Overall, the book still feels unfinished to me. Perhaps it's because of the very sketchy drawings, or the pencils lines that are supposed to be erased but are not, but mostly because there could be more instructions provided. If you're a beginner, I would recommend getting the other Loomis books which are more detailed, more satisfying to learn from, and represent better value for the money spent.